The Cardigan Welsh Corgi is a long, low to the ground dog. Their backs are actually not longer than most dogs’, their legs are just very short in comparison. The topline is level. The head is in good proportion to the rest of the dog. The broad, flat skull is rounded and tapered. The muzzle is parallel with the skull and has a moderate stop. The nose is black in all colors but may be butterfly in merle-colored dogs. The teeth meet in a scissors bite. The wide-set eyes are medium to large in size with dark rims. The oval eyes are shades of brown depending on the dog’s coat color. 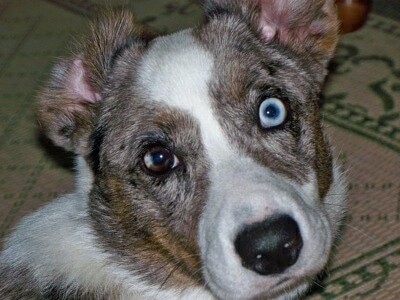 Dogs with a blue merle coat may have blue eyes, either both eyes, or one of each. The eye rims are black. The erect ears are large in proportion with the rest of the dog, moderately large at the base and slightly rounded at the tips. The chest is deep with a prominent breastbone. The legs are very short. The tail is low-set and long. Dewclaws are usually removed. The round paws are relatively large and the front feet turn out slightly. The double coat has a short, thick, weather resistant undercoat with a longer, coarser outer coat. The coat is longer at the ruff, back of the legs and on the underside of the tail. Some Corgis are born with longer coats called the "fluffy Corgi" or "long-haired Corgi." These dogs do not make the written standard and cannot be shown. Coat colors include red, sable, fawn, brindle, black and brindle, blue merle (black and gray; marbled), black and tan with white markings. There are often white markings on the legs, chest, neck and parts of the muzzle. The Cardigan Welsh Corgi is highly intelligent and obedient, able and willing to please its owner. Reliable, dedicated and loving, but can be wary of strangers. Socialize well, preferably when young. Corgis are extremely active and devoted little dogs, and are good with considerate children so long as the dog sees himself below humans in the pack order. Protective and sturdy, they make fine guards, and excellent show and obedience dogs. 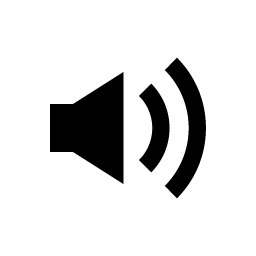 Good with other non-canine animals, but can be combative with other dogs if the owners do not properly communicate to the dog that aggressiveness is an unwanted behavior. They sometimes attempt to herd people by nipping at their heels, and should be taught not to do this. The Pembroke tends to bark a lot and makes a good watchdog. If you find your dog is barking at you in order to communicate, you need to hush the dog and look into your leadership skills. A dog that is barking at you in that manner is showing signs of dominancy issues.If you can treat your Corgi in such a way that he is mentally sound, he makes a wonderful companion. Issues will arise if the dog is above the humans in the pack order and if he does not receive enough daily exercise. 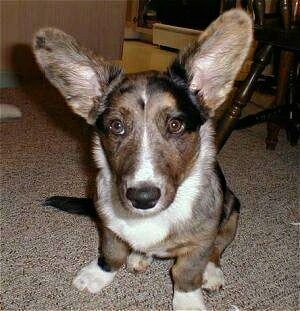 Do not allow the Corgi to developed Small Dog Syndrome. Even more active that the Pembroke; Cardigans must have regular exercise, including a daily, long walk. While out on the walk the dog must be made to heel beside or behind the person holding the lead, as in a dog's mind the leader leads the way, and that leader needs to be the human. The wiry, medium-length water-resistant coat is easy to groom. Comb and brush with a firm bristle brush, and bathe only when necessary. The coat is shed two times per year. The Cardigan Welsh Corgi is older than the Pembroke Welsh Corgi, with the Pembroke being bred out of the Cardigan. Both Corgi varieties may be a descendant of the Keeshond, Pomeranian, Schipperkes and the Swedish Vallhund. Some say the older Cardigan was from Cardiganshire, brought there by the Celts in 1200 BC, whereas the Pembroke's ancestors were introduced by Flemish weavers to the Celts in the 1100s. Whatever the case may be, the Cardigan and the Pembroke Welsh Corgis were interbred and considered the same breed up until 1934 when a show judge thought they were too different and separated them into two different breeds. After they were separated the Pembroke gained in popularity and is to this day more popular than the Cardigan. The name "corgi" is specific to that type of dog breed in Cymreig (Welsh). Dog in Cymreig (Welsh) is 'Ci' or if it is softly mutated 'Gi,' hence Corgi. The Pembroke was actually recognized by the AKC a year before the Cardigan. The Cardigan was recognized in 1935 and the Pembroke in 1934. Corgis were used as cattle drivers, vermin hunters and farm guards. They drove cattle by barking and nipping at the cattle's heels rather than just herding them. The dog's low stature helped him roll out of the way of kicking cows. 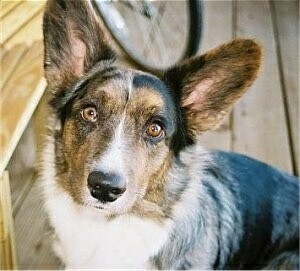 "Heidi, my Cardigan Welsh Corgi is well tempered. She is 5 years old and healthy. When we first got her she was a little underweight so we plumped her up, but the vet said a little too much. As you may know already it is pretty hard for Corgis to lose weight. But with at least 30 minutes a day we got her to a perfect 23 pounds. It is very important to keep Corgis in shape because of their short legs. Otherwise they might have future joint problems. One good way for them to lose weight is swimming. It doesn't put pressure on their joints and gives them a good workout. Heidi loves going to dog beach and chasing all the seagulls and ducks into the water." Jacob the Corgi all grown up! 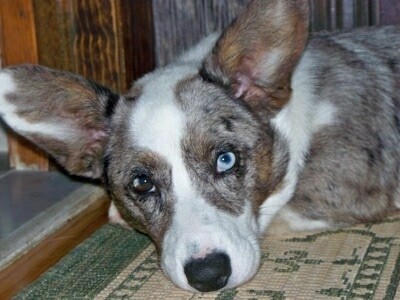 "Scout is a 7-month-old purebred Cardigan Welsh Corgi. Both of her parents are AKC champions. Scout is a home companion who’s a working dog through and through. She takes long walks every day and plays squeaky toy. Her owner watches Cesar Millan and also reads Jon Katz books." 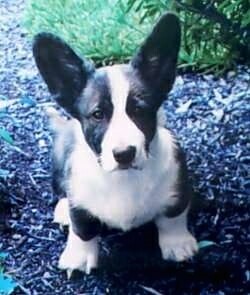 Scout the Cardigan Welsh Corgi at 7 months old. Scout has one brown eye and one blue eye. "This is Heidi, my dog. 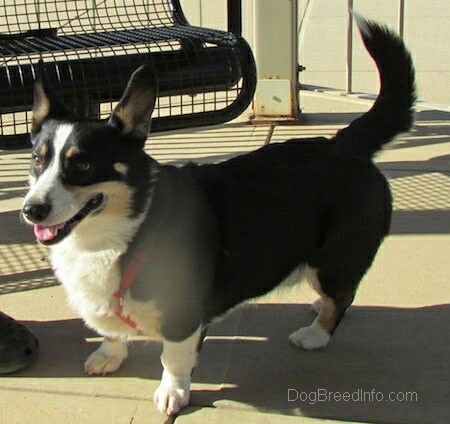 She is a two-year-old Cardigan Welsh Corgi. When we wanted a dog, we all decided that it would be best to rescue a dog from the pound. My family decided to pick Heidi to see in one of those little fenced areas to see if we wanted to have her. We were in there for about a half hour and she didn't even want to look or have anything to do with us. But for some reason we were all very attached to her. When we decided to adopt her the employees at the pound were so relieved because she has had past aggression that they worked with a lot. After the first couple weeks she was with us she became so attached to us that if I left the house for five minutes she would start whimpering and wining as if she were crying. For the first nine to ten months Heidi did not like strangers at all. If anyone out of the family would come in to our house she would growl, bark and even try to lunge at them. She has never bitten anyone, even when someone puts their hand out for her to get a whiff she'll just keep on barking. After a lot of good stable routine and exercise and socializing with enough people she has become the sweetest dog ever. She even treats little kittens as if they were her own puppies and bathes them. After having Heidi as an addition in our house I wouldn't have chosen any other dog." This is Rocky at 7 months old. 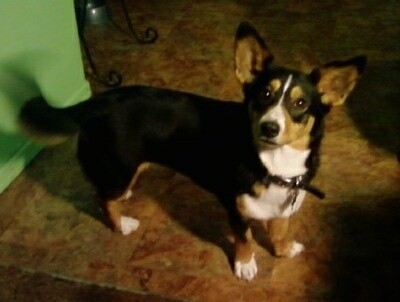 His owner says, "He is a sweet, exuberant, bundle of energy!"